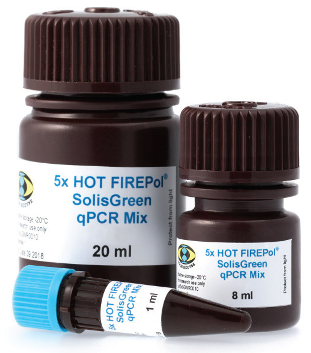 HOT FIREPol® SolisGreen qPCR Mix is an optimised ready-to-use solution for real-time quantitative PCR assays, incorporating SolisGreen dye. It comprises all the components necessary, excluding the template and primers, to perform highly sensitive qPCR. The user simply needs to add water, template and primers. 08-46-00001 1 ml 5x PDF PDF PDF 57 EUR Login to buy! 08-46-00008 8 ml 5x PDF PDF PDF 432 EUR Login to buy! 08-46-00020 20 ml 5x PDF PDF PDF 970 EUR Login to buy! Shipping and temporary storage for up to 1 month at room temperature has no detrimental effects on the quality of HOT FIREPol® SolisGreen qPCR Mix. FIREPol is a trademark of Solis BioDyne. Applied Biosystems is a trademark of Applied Biosystems LLC. QuantStudio and ViiA are trademarks of Life Technologies Corporation. Stratagene, M30005, MX3005P are trademarks of Agilent Technologies inc. Mastercycler is a trademark of Eppendorf AG. Rotor-Gene is a trademark of Qiagen GmbH. CFX96 and CFX384 are trademarks of Bio-Rad Laboratories. LightCycler is a trademark of Roche Diagnostics GMBH. The Eco is a trademark of Illumina Inc.